*If your mattress is irregularly shaped or sized, and you don’t see the measurements you need, call us at 888.889.2812. In most cases we can customize the mattress to fit your unique space. The “Commander” is our entry level mattress for the recreational boater. Whether you’re in the waves, or “making waves” of your own, this marine mattress feels great. It has a foam density of 1.8-1.9 lbs. per cu. ft., which is specifically designed for the perfect balance between comfort and cost in a 5-inch thickness, where space is at a premium. If the height of the boat mattress is a concern, (i.e. a bunk or loft bed,) the “Commander” model is only 5 inches thick. Because it’s made with high quality foam, it’s a very good marine mattress designed to have a medium firmness. Even better, it won’t bottom out with a person weighing up to 200 lbs. 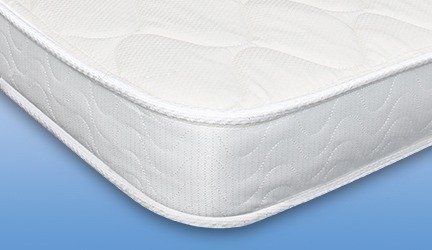 It easily beats any 5-inch spring mattress in comfort and durability. 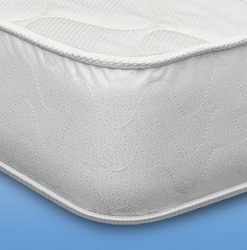 Like all of our marine mattresses, this mattress has a sewn cover with a tape edge. 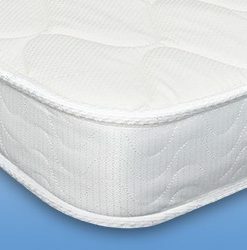 The top sleeping surface is made from quilted damask, and the bottom is skid resistant fabric so it won’t slide around. Only 5-Inches Thick—If the space above this mattress is a concern, this marine mattress gives you every inch of headroom you can get without sacrificing support. We get the best performance out of the thinnest mattress possible that we feel comfortable manufacturing. Great Support for a Thinner Mattress—Foam density isn’t the only reason why we can get great support out of a thin boat mattress. We specify our foam to have a high compression factor, also known as ILD. Ours is between 23 and 26, which ensures that you will feel comfortably supported and you will not bottom out, as long as you weigh less than 200 lbs. Durable—Specifically designed for the marine environment. And there’s no zip on cover with us. We cover this mattress just like the one on your bed at home. All of our seams are sewn shut using a durable fabric tape. Lou: many thanks for a prompt delivery and a great customized product, fits like a glove, in the aft cabin on my 40 ft. Hunter. Would recommend your company and service to anyone thinking of getting rid of that old mattress. And the pad is also a must. Best regards, JR.